The Batman: Arkham Knight post-launch DLC has been somewhat of a disappointment. While the Batgril: A Matter of Family episode was a welcome addition, bringing that character in the Arkham universe for the first time in a brand new area and the extra costumes have been nice, the stand-alone Arkahm Episodes have been a big let down. Despite being able to play as classic Batman heroes and villains like Harley Quinn, Nightwing and Red Hood among others, the barely a half-an-hour expansions added just as little to the lore of the Arkham universe as they did play time. Having my expectations lowered significantly, I wasn’t expecting much going into the final story based content, titled Season of Infamy, even though it saw the return of classic villains that didn’t get to make an appearance in the main conflict. After completing Season of Infamy, I’m of two minds because it is an absolute must-play for fans of Batman and the Arkham universe, yet it comes a little too late to redeem the Season Pass as a whole. Unlike the Arkham Episodes stories that were contained experiences in two-three small environments, Season of Infamy returns to the open-world Gotham City from the main game and puts you back in control of the Dark Knight himself instead of a member of the extended Bat-Family. You’re tasked with recapturing four escaped villains: Mr. Freeze, Killer Croc, The Mad Hatter and Ra’s Al Ghul in whatever order you wish, each being selected in exactly the same way you went about tackling sub-missions in the main game featuring the Penguin, Two-Face, etc. As the focus is put back on Batman, Infamy feels like the first real extension of the main story. I loved being able to play as other characters like Nightwing in the episode stories, but Rocksteady has gone on record as stating that there was no possible way to incorporate them into the open-world as it was designed to only be played as Batman; even Nightwing makes a joke about this in Season of Infamy where he mentions it takes him longer to get around because he doesn’t have a cape. It was great to once again be on the hunt for super-villains, gliding around the dark yet beautiful city, listening to the banter of street criminals or just hopping into the Batmobile to cruise around. It’s difficult to talk about what exactly makes Season of Infamy so great without getting into spoilers which I don’t do here, but each villain’s story has a complete arc that brings their journey through the franchise to a satisfying conclusion just as much as Batman’s. Some are much better than others, in particular the Mad Hatter portion but even that has a really interesting pay off in its closing moments that again I won’t spoil here for those who haven’t played it. One chapter lets you do something that I’d never thought they would let you do in a Batman video game ever, and I’d honestly like to replay through this again to find out how things would’ve played out had I went the other way. Never before have you had any real choice in how the story in the Arkham games played out, and it’s interesting to see Rocksteady make such changes in what is said to be their final turn at the character. Not only does Season of Infamy add new villains to go up against, but it also adds new places to explore as well. Though the areas aren’t huge mind you and it only takes around three hours or so to complete all four stories, it’s nonetheless nice to have something new to look at and explore in Gotham City, like the frozen tanker ship in Mr. Freeze’s story and the downed blimp in Killer Croc’s portion with some haunting video logs that everyone should sit through. In this final chapter it seems like Rocksteady took a lot of people’s complaint’s about the over use of the Batmobile as it only makes a brief appearance for a generator charging puzzle and a Poison-Ivy esque root hunt as well as one final tank battle that, for me at least, had some real stakes and a lot of tension. 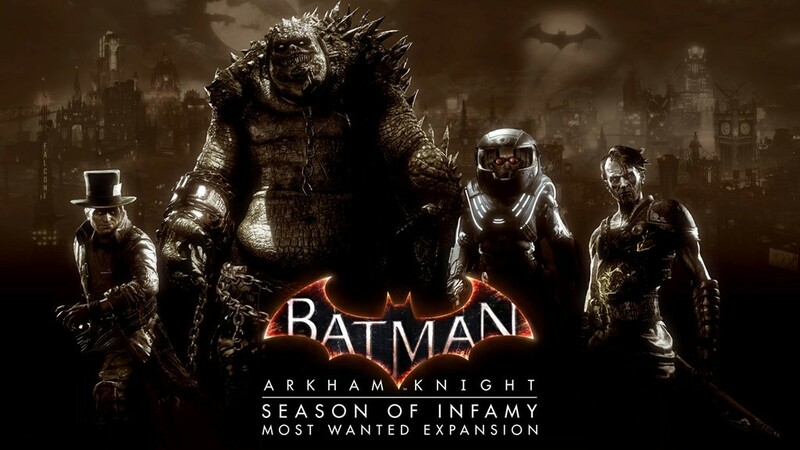 For those who threw down the money to get the Batman: Arkham Knight season pass, there’s absolutely no reason not to download Season of Infamy and at a low-cost of about $10, it’s a good price for what you get here if you didn’t. Ultimately though this is the Revenge of the Sith of the Season Pass: It’s clearly the best over what came before it, though what came before it wasn’t exactly that great either, making it best by default. Had this been the standard instead of the exception, the Batman: Arkham Knight Season Pass would have been an easy recommendation, even at its original asking price. I’m sad it has taken Rocksteady to get around to delivering content of this caliber in the post-launch Batrman: Arkham Knight content, but it’s also a great note to leave off on.